1832: Death of Jean-François Champollion. 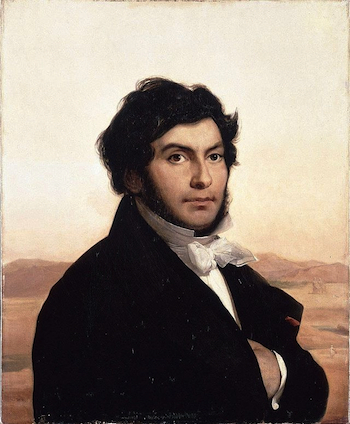 4 March 1832: Death of Jean-François Champollion, French scholar who used the Rosetta Stone to decipher Egyptian hieroglyphs. Photo by Leon Cogniet via Wikipedia. Learn more about the Rosetta Stone and the Rosetta Stone replica that was temporarily on-loan to the National Cryptologic Museum via the link at the bottom of the page. Excerpted from Wikipedia: A child prodigy in linguistics Champollion gave his first public paper on the decipherment of demotic in 1806, and already as a young man held many posts of honor in scientific circles. In 1820 he embarked in earnest on the project of decipherment of the hieroglyphic script, soon overshadowing the achievements of British polymath Thomas Young who had made the first advances in decipherment before 1819. In 1822 Champollion published his first breakthrough in the decipherment of the Rosetta Stone hieroglyphs, showing that the Egyptian writing system was a combination of phonetic and ideographic signs. In 1824 he published a Précis in which he detailed the decipherment of the hieroglyphic script demonstrating the values of the phonetic and ideographic signs. In 1829 he traveled to Egypt where he was able to read many hieroglyphic texts that had never before been studied. The hardships of the journey cost him his health and he died in 1832, 41 years old. His grammar of Ancient Egyptian was published posthumously. He is considered the founder of the discipline of egyptology.